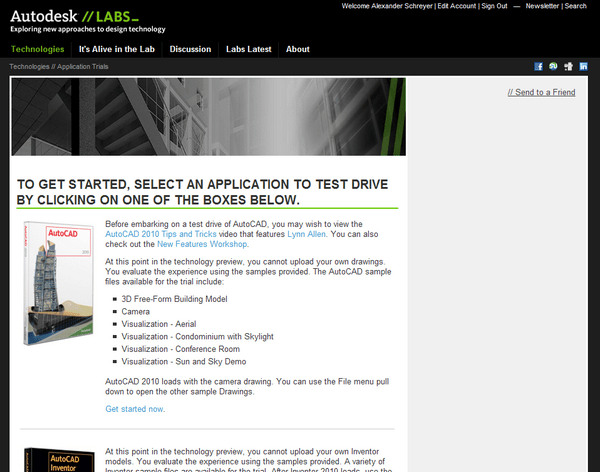 [as] > AEC CAD/BIM > Web-Based Application trials from Autodesk – A Great Idea! And the good ideas keep on coming! As just announced by Autodesk Labs in their post Project Twitch Range Expanded: can YOU connect?, Autodesk extended the range of their application tryout platform “Twitch” beyond the originally stated 1000 mile radius. Now user connection capability is just limited by a network latency cutoff. And as I just found out, this means that I am able to connect – from Massachusetts. AutoCAD even loaded faster than on my local machine! I very much like the idea of web-based software tryouts. Typically when I try software on my (admittedly aging) machine, it leaves some garbage behind that even my Revo Uninstaller can’t safely get rid of. Autodesk’s “twitchy” little app would get rid of that problem by running the application itself on a remote server and letting users download a small viewer that remotely connects to its user interface. Of course, this doesn’t allow to test application performance on the local machine and how well it works with the given hardware and graphics configuration. But it is a great first step in the testing cycle. It gives me now hope that more software vendors will go this route and offer free web-based “live” previews of their programs. This might even be an idea for Google or Amazon to run in their data centers. P.S. : Apparently the developers are quite taken with their own product. One of the DLLs installed by this service is called “awesomium.dll”.